In a previous blog post, I investigated my travel time to work using an estimate from Google Maps. In that post, my possible departure times to and from work were the same every day. However, it’s not uncommon in designs, even when using computer simulators, to have restrictions on the design space. Since JMP 11, this could be accommodated for space filling designs using Disallowed Combinations, but it required a Boolean JSL expression, and you needed to remember that categorical factors have to be specified with an ordinal value. 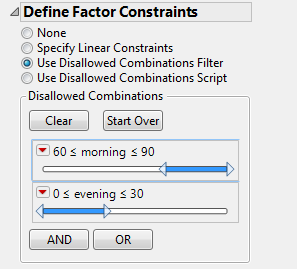 We tried to make specifying disallowed combinations easier in JMP 12 with the new Disallowed Combinations Filter. In the commute time example, after I move past the first screen, there’s an outline box for Define Factor Constraints underneath the factors. Linear Constraints works as before, and the Disallowed Combinations Script is the option if you want to use Disallowed Combinations via a JSL expression. Let’s take a look at the Disallowed Combinations Filter. Selecting that option brings up a list of the factors in something that has a similar look to the Data Filter for Data Tables. 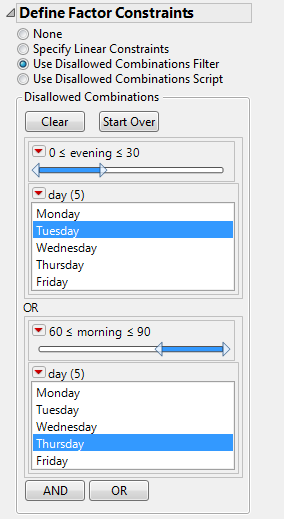 When I create the design, none of the rows will have both morning >= 60 and evening <= 30 together. Now I can go ahead and create the design. 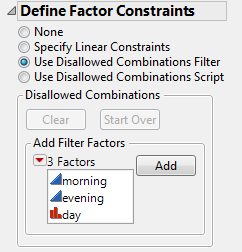 The Disallowed Combinations Filter appears in Custom Design, Space Filling Design, Covering Arrays and Augment Design. If you create a design with the Disallowed Combinations Filter, the saved script has Disallowed Combinations converted into the JSL Boolean expression. This means that running the DOE script does not bring up the Data Filter, but rather the “Use Disallowed Combinations Script.” I have found this useful to create larger disallowed combinations scripts with lots of “OR” statements when the Filter method begins to get tedious.